What is the Oh Snap Selfie Photo Booth? The Oh Snap Selfie Photo Booth, also known as a Selfie Station, is a top of the line modern photo booth with more capabilities than anything currently in the market. It is an open air photobooth so your guests are not squished and others can see the fun. The easy to operate Oh Snap Selfie Photo Booth takes high quality pictures using a professional DSLR camera, then guests can edit and personalize photos using the 32-inch interactive touchscreen. It is also the only photobooth in Houston that records up to 60 second video so your guests can toast the Bride & Groom, give wishes to the Birthday Boy/Girl, or even be used to record product endorsements and testimonials. Your guests will have fun taking their selfies and spreading the cheer via print, text, email, or social media uploads! Please visit the Features page to learn more about our Oh Snap Selfie Photo Booth. Our Oh Snap Selfie Photo Booth is sure to be the life of ANY party. Whether you’re celebrating or marketing, Oh Snap Selfie will be there! Oh Snap Selfie Photo Booth provides loads of entertainment and networking opportunities and is a hit at weddings, anniversaries, birthdays (all ages! ), holiday parties, bridal showers, baby showers, graduations, school events, community events, grand openings, fundraisers, corporate events, tradeshows, and more! 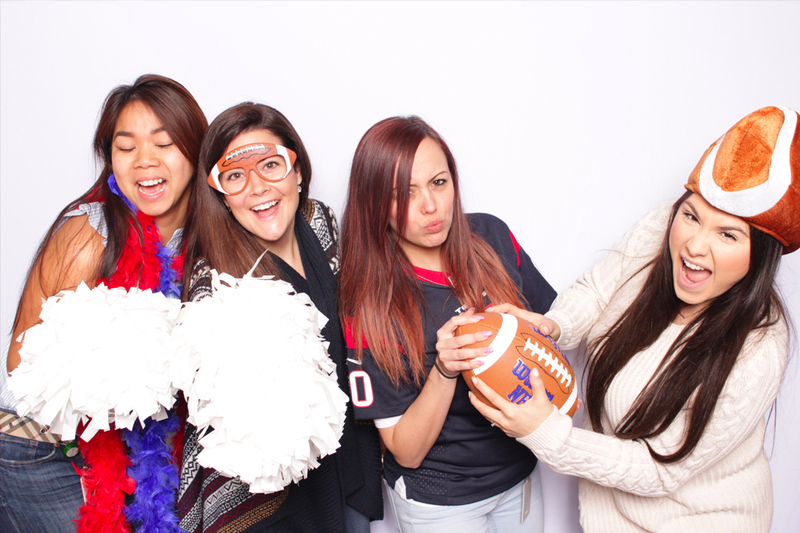 Grab a prop & strike a pose…the Oh Snap Selfie Photo Booth will do the rest! Using the sleek and easy touch-screen you can Print, Email, Text, Tweet or Facebook instantly! It’s quick, easy and fun! An Oh Snap Selfie Photo Booth professional attendant will also be there the entire time to help your guests operate and enjoy the photobooth! See our Features page for more info. How does the Green-Screen work? Using a Chroma-key green backdrop, our machine instantly replaces the green with a digital background of your choice. Your guests can choose from several different backdrops using the touch-screen kiosk. We will work together before your event to choose up to 6 backdrops that will go perfectly with your theme, or design a custom Step and Repeat digital background showcasing your logos, monograms or text. This is a great way to incorporate a party theme or market your brand. Please note, if your guests are wearing anything green, it will blend in with the background (sometimes guests have fun with this!). See our Features Page and Photo Gallery for more info. Does the photo booth print the pictures on the spot? Yes! The Oh Snap Selfie Photo Booth printer is super-fast. It prints and cuts high quality photos in 8 seconds! Choose the Oh Snap! or All Day Packages for unlimited high quality 4”x6” prints or 2”x6” strips as keepsakes and favors for your guests. Please see our Features and Pricing pages for more info. Do we have limit on taking pictures? Absolutely not! All of our rental packages include UNLIMITED Pictures and Video! You and your guests can take pictures and share via text, email, Facebook and Twitter as many times as humanly possible during the event! Choose the Oh Snap! or All Day Packages for unlimited high quality 4”x6” prints or 2”x6” strips as keepsakes and favors for your guests. Absolutely! Fun party props are included with all of our rental packages, but please feel free to bring your own! Can you have different backgrounds/backdrops, or can I bring my own? Yes! You can choose one of our standard backdrops. The Oh Snap Selfie Photo Booth can also take pictures with or without a backdrop, so if there is something cool in the background let that be your backdrop! You can even bring your own printed or hand-made backdrop (i.e. fringe, streamers, balloons, bunting, etc), or we can create a custom one for you! An 8ft by 8ft PAPER or FABRIC backdrop works best. If you want more than one backdrop, we recommend our Green Screen option which allows your guests to choose up to 6 different photo backgrounds! Please see our Pricing page for more information. Can your photo booth be customized for my event? Of course! We can create custom layouts and frames for your photos. You can also add logos, monograms, hashtags, messages, dates and more to your pictures. The Oh Snap Selfie Photo Booth machine can also be branded with your logo, monogram or custom message for instant visibility. Please see our Pricing page for more information. Can the booth be used outdoors in open sunlight? Yes! Weather permitting, our photo booth can be used indoors or outdoors (protection from outside elements is required). Your Oh Snap Selfie Photo Booth rental also includes our premium lighting kit which will adjust to any direct sunlight or dim lighting issues, ensuring high quality professional photos every time! Can I have extra copies of the photos after the event? We will post all of your event photos to an Online Gallery where you and your guests can download them for free, or purchase prints. We will also send you a USB flash drive with all your pictures and they are yours to print or do with as you please! Do you charge extra for delivery of your photo booth? How much space and time do you need to set up? Delivery, setup and breakdown are included with your rental. All you will need to provide is approximately a 10ft long x 10ft wide x 10ft high space for set up. We will arrive about two hours ahead of your event time to set up and will breakdown immediately after the event time. If the event location is more than 30 miles from 77497 or you need us to set up early, additional fees may apply – please see our Pricing page for more info. Please note, the photo booth machine can not be taken up any stairs (must have ramp/elevator available). Do I need to provide a table or linens for the photo booth? Oh Snap Selfie Photo Booth will bring our own 6 foot table with a black linen for the fun party props, and scrapbook/guestbook (if applicable). If you would like a different color linen or table size, this will need to be provided to us by you or the venue/caterer. Does the photo booth need to be plugged in? Yes, we must have access to a free power source (110V, 20 amps, and 3-prong outlet), preferably within 3 feet of the setup area. Extension cords may be needed, but not recommended due to potential tripping hazards. Do I need to provide Wi-Fi? Most venues provide free access to their Wi-Fi, but we will also bring our own internet hotspot to ensure we are connected to the internet at all times so your guest can share their pictures via text, email, Facebook and Twitter. If for any reason we still cannot connect to the internet, all of emails and text messages will be sent as soon as the internet connection is restored. I’m ready to book the Oh Snap Selfie Photo Booth, when do I have to pay? A 50% deposit is due at the time of booking, the remaining balance is due ten days before the event. Please Contact Us for more info. We are available to answer all of your questions via phone or text to (832) 607-4421, email at info@ohsnapselfie.com, or you can Contact Us through the website. You can also check us out on Facebook, Twitter and Instagram for the latest pictures, specials, tips, ideas, and more! https://ohsnapselfie.com/wp-content/uploads/2017/07/blog01.jpg 686 1030 balraj talawant https://ohsnapselfie.com/wp-content/uploads/2017/06/logo-1.png balraj talawant2017-07-19 18:26:552017-07-20 01:56:36What is the Oh Snap Selfie Photo Booth?